What a Technician is required to know about Fuel Rail Pressure Control on a Common Rail Diesel (CRD). Maintaining the correct fuel pressure under all driving and load conditions is a requirement for the efficient operation on a Common Rail Diesel (CRD). An ECU operated suction control valve (SCV) or fuel metering control valve (FMCV) located on the back of the high-pressure supply pump is utilised for this purpose. which controls the output volume and pressure in the fuel rail. The supply pump only compresses the amount of fuel needed to maintain the rail pressure required. This assists in reducing emissions by reducing engine operating load. Reducing fuel flow during operation also results in lower fuel temperatures. Common typical faults affecting SCV operation. Excess wear, contaminated fuel or an electrical malfunction with the SCV or FMCV can create major driveability problems and possible no start condition. Generally, the SCV is available as a replacement unit for a range of CRD supply pumps. Many of these units may look similar but vary internally BOTH mechanically and electrically. It is important to fit the correct valve for efficient operation. Some earlier Bosch CRD systems utilise a fuel rail mounted “pressure control valve” operated by the ECU and did not utilise a pump mounted SCV. Many later CRD systems now utilise both a fuel rail mounted “pressure control / relief valve” as well as a pump mounted SCV for improved rail pressure control. The SCV may be classified as a normally open or normally closed operating unit. It is important to realise that disconnecting the harness connector on one type will create a totally different result to the other type. A normally open type “generally” results in maximum rail pressure when the harness is disconnected during engine running. A normally closed type “generally” results in a minimum rail pressure when the harness is disconnected during engine running. This operation can assist the technician when it comes to diagnostic procedures when rail pressures are suspected of being incorrect. The ECU will generally operate the SCV by PWM to control the rail pressure as required for the driving and load conditions. 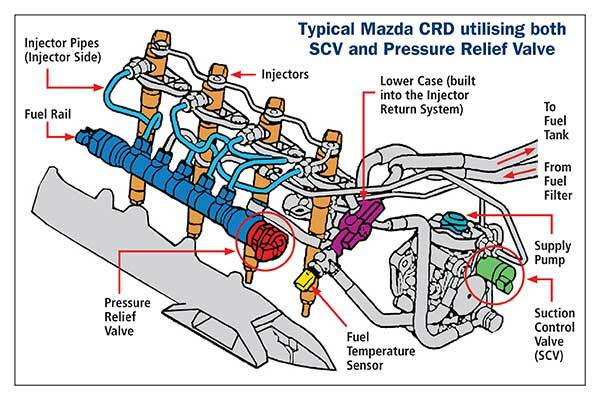 This pressure is monitored by the fuel rail pressure sensor to ensure suitability. A suitable scanner to monitor rail pressure increase and decrease during acceleration and deceleration can assist the technician in diagnosing SCV faults. Even though the SCV is commonly renewed for pressure and driveability problems, it is important to find the cause to minimise having to carry out any rework. The Premier Auto Trade rapidly expanding Fuel range includes Suction Control Valves (SCV) from the world’s leading manufacturers, covering over 2 million vehicle applications in Australia and NZ.